Inside today's bento were : seaweed rolls, orange chicken (the sauce was inside the rabbit container), baby zucchini with carrot on the top. Sprinkled the rice with fish furikake, and planted some flower eggs on the rice. On the top of the flower egg was quail egg sliced around 3mm and decorated with nori. I preferred to use my kitchen scissor to make the flower egg rather than to use knife. It was easier to get a neat cut with a scissor. those egg flowers are so cool, thanks for the scissor tip! the baby zucchini are super cute, too. 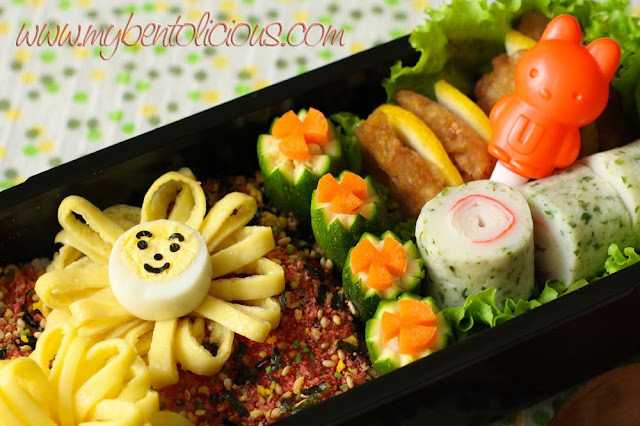 what a sunny happy bento, yay! WoW Lia Chen, This is really pretty :D Hope I can do it like yours. Lovely bento Lia! Everything is super cute and happy... I like the sunny flower face and teeny zucchini. Hope you get a nice day tomorrow! Fabulous bento box. I've alway admired the egg flower technique. Your bentos make me smile. How is your little boy? Feeling better I hope! Lia Chen, weather is Malaysia is just opposite. It rains almost everyday and thus causes bad traffic jam in KL. Hot and dry ~.~ can't imagine it here. It's cold. The mountains around me are cowered with snow already ^^"
But your bento let the sun shine for me ;) But a question: What's around the surimi? Love the egg flowers...They look like the big poofy bows on christmas presents! @Anncoo : I'm sure you can, your cooking is amazing. Thanks Anncoo! @hapabento : Thanks a lot Debra ... Andrew is ok now, how about you? Are you feeling better? I like the flowers so much...they would make my day more happy and sunny. I envy your kids so much. i like the baby zucchini with carrots! !